Leverage clckwrk templates and best practices that you can now use in your e-Business Suite migration to Amazon Web Services (AWS) to avoid lengthy design and development cycles and to get an environment up and running on AWS in a matter of days. This solution is supported by a consulting offer from clckwrk, an APN Advanced Consulting Partner and AWS Oracle Competency holder. AWS Oracle Competency Partners deliver Oracle migration assessments, integrate relevant AWS services, and accelerate the ramp-up of new users. 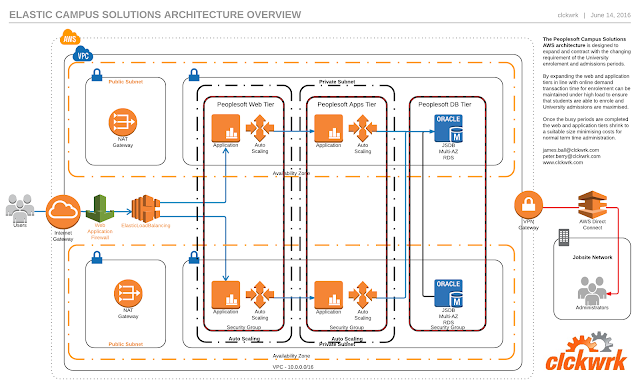 This solution was developed in collaboration with clckwrk, an APN Advanced Consulting Partner and AWS Oracle Competency Partner. Discover value from this solution by gaining access to AWS credits to support a Proof-of-Concept (PoC) with a consulting offer from clckwrk that includes AWS co-investments. Click below for more information. Engage with clckwrk’s sales team for a brief discussion to determine financial impact, strategic goals, methodologies, and scope. clckwrk will work with your organization to develop the ideal plan to meet your specific Oracle workload needs. APN Partners with the AWS Oracle Competency designation offer consulting services to help you migrate your Oracle workloads to the AWS cloud. This solution is offered by clckwrk, an APN Advanced Consulting Partner and AWS Oracle Competency holder. This solution is offered by clckwrk, an APN Advanced Consulting Partner and AWS Oracle Competency holder. Discover value from this solution by gaining access to AWS credits and co-investments to support a Proof-of-Concept (POC) with a consulting offer from clckwrk. Click below for more information. Discover value from this solution by gaining access to AWS credits and co-investments to support a Proof-of-Concept (POC) with a consulting offer from clckwrk, an APN Advanced Consulting Partner and AWS Oracle Competency holder. Click below for more information.